MINNEAPOLIS – March 14, 2019 – VigiLanz, a clinical surveillance company, has been featured in the Infection Control 2019 Report from KLAS Research, released today. The report aggregates and analyzes interviews from thousands of healthcare professionals about the products and services their organizations use. In the report, KLAS characterizes VigiLanz as a market leader for its high customer retention and innovative technology additions, such as active alerting, in its Dynamic Infection Control Monitor product. VigiLanz is also recognized for providing advanced automation and predictive analytics, two capabilities KLAS identified as highly desired by the market. VigiLanz’s Dynamic Infection Control Monitor is a seamless, real-time automated monitoring system that works with EMR systems. Its automatic exception-based alert system continuously surveils all patient records to alert decision makers in real time of potential infections, drug-bug mismatches, MDROs, isolation candidates, organism clusters, conditions of concern, and reportable infections. The surveillance is based on a sophisticated set of customizable rule engines. In addition to being a leader in this report, KLAS recognized VigiLanz in the 2019 Best in KLAS report, earning 2019 Category Leader designations for Antimicrobial Stewardship, Infection Control and Monitoring, and Pharmacy Surveillance. Founded in 2001, VigiLanz (www.vigilanzcorp.com) is a privately held, rapidly growing provider of SaaS-based clinical surveillance solutions. The firm is focused on aggregating disparate EMR transactional workflow and documentation data across health systems to identify real-time clinical issues that avoid or minimize harm, optimize clinical outcomes and support preventive care. VigiLanz supports a large and growing community of hospital CMOs, CMIOs, CIOs, quality teams, infectious disease and control specialists, pharmacists, and other clinicians dedicated to real-time inpatient and outpatient care. Market Report: Clinical Surveillance: The Next Step in Value-Based Care. Feb. 2019. VigiLanz. Houston Methodist Sugar Land Hospital first in country to launch new point-of-care alert solution with pharmacist-only rollout. BIRMINGHAM, HOUSTON, & MINNEAPOLIS – February 6, 2018 – The CDC estimates that 20 to 50 percent of antibiotics prescribed in U.S. acute-care hospitals are unnecessary or inappropriate. With the need for healthcare systems and federal agencies to increase their focus on antibiotic stewardship, both providers and pharmacists play a vital role in monitoring safe and appropriate use. Today, VigiLanz, a clinical surveillance company, and IllumiCare, a leading provider of point-of-care technology, announce a partnership to increase visibility within providers’ and pharmacists’ normal workflows around antimicrobial therapy monitoring. IllumiCare’s Smart Ribbon® is an EMR-agnostic, non-intrusive ribbon of information that hovers over the EMR and provides patient-specific information such as the costs and risks of medications and tests, opioid exposures, and more. The Smart Ribbon displays VigiLanz’s Antimicrobial Stewardship Solution in a more visible, convenient and accessible place in the EMR when the provider or pharmacist is making care decisions. With this ability to respond to context in real-time, the Smart Ribbon only delivers notifications on issues or opportunities that busy clinicians and pharmacists can personally act on. This increases engagement with the VigiLanz insights and saves pharmacists the time and energy often spent tracking down a clinical counterpart to resolve an activation that’s halting the workflow. Houston Methodist Sugar Land Hospital is the first health system to deploy the VigiLanz clinical surveillance alerts within IllumiCare’s Smart Ribbon. Pharmacists can choose to engage with VigiLanz activations by viewing them, marking them as necessary and providing comments, all within their current workflow in the EMR. One of the most important activations is the visibility of drug-bug mismatches, in which the antimicrobial a patient receives is not adequate for the microbiological organism presumed to be causing the clinical infection. Additionally, the VigiLanz alerts highlight broad antimicrobial use, de-escalation opportunities, and conversion opportunities to move the patient to an antibiotic that has equal efficacy but is less expensive, such as from IV drugs to oral medications. Interoperability between EMRs and other applications is a key challenge in healthcare today. Application Programming Interfaces (APIs) have transformed interoperability in other industries and now healthcare, too, is increasingly relying on them to solve important clinical and business problems. VigiLanz recently co-hosted a panel discussion on the topic, with one of its partners, Sansoro Health, which featured leaders from a diverse group of healthcare organizations, who shared how they use proven API solutions to successfully address complex, real-world clinical, operational and workflow challenges. Although the three panelists were at different stages of their journey in leveraging APIs to provide better healthcare solutions, more rapidly and at lower cost, all recognize that legacy technology does not meet their needs for integration with EMRs and data liquidity. As moderator of the panel discussion, David Levin, MD, Chief Medical Officer of Sansoro Health and former CMIO of Cleveland Clinic Health System, explained it’s vital to have bi-directional data flow back into EMRs to save clinicians from double documenting. It’s an issue that Peter Chang, MD, Chief Medical Information Officer, Tampa General Hospital, faced, until he implemented Sansoro Health’s Emissary® API solution to deliver efficient, real-time read-and-write EMR interaction across complete patient demographics and clinical data. The longest established API user of the group, Dr. Chang spoke about how his hospital leverages APIs to focus solely on their application and not get disrupted on the integration. Tampa General Hospital can now integrate in a matter of days across EMRs, sourcing all the data its clinicians need. Adam Klass, Chief Technology Officer of VigiLanz, at the middle stage of the middleware journey, spoke on how APIs reduce barriers to EMR integration and can be rapidly deployed to provide robust, real-time interoperability between complex applications. To help healthcare providers deliver real-time results and improve interoperability, he described how medical facilities today require a services-oriented architecture and API. The API must enable efficient aggregation, interaction and exchange of disparate data throughout the health care enterprise and across any of its software technologies, including EMRs and third-party vendors. Klass, one of the company’s original founders in 2001, outlined the company’s mission of providing real-time clinical decision support to its customers by helping with all manners of manual data collection processes, using data and real-time rules engines. From pharmacy surveillance and predictive models to antimicrobial stewardship and other clinical use cases, the company relies on receiving EMR data in a timely manner. 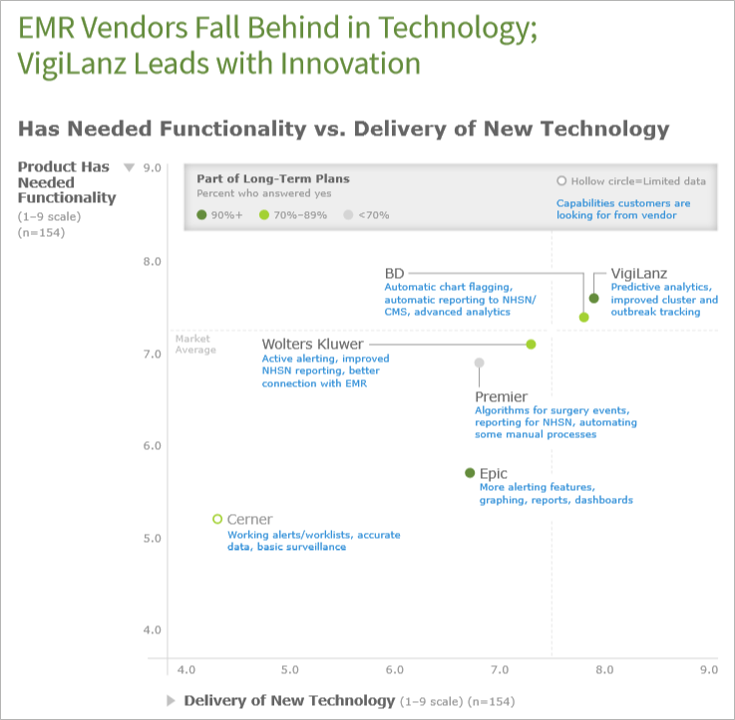 VigiLanz has always sought to answer the question of how to extract data from an EMR. It wasn’t rocket science, in Klass’ words, and yet it was challenging to collect the same data from every hospital in every EMR, in a way that enabled customers to have an intimate understanding of provider behavior through benchmarking. A creative solution was needed. It’s one reason VigiLanz partnered with Sansoro Health to develop its VigiLanz Connect solution, which plugs into an organization’s EMR in less than one week for hospital IT-lite integration. Traditional integration methods are often customized for each installation, require regular maintenance and cannot be reused. Using a standard set of population-based APIs that facilitate seamless, real-time, bi-directional data flow, VigiLanz Connect normalizes data faster—and empowers clinicians to make an impact sooner. It plugs in once to deliver standardized, interchangeable APIs for seamless integration across all data sources. VigiLanz Connect has now been successfully deployed at several hospitals. Matthew Cunningham, Executive Vice President of eviCore, described how his company is comprised of more than one thousand doctors and nurses in its ranks, so it needs a robust, flexible platform to identify and distribute the precise data and analytics to make informed, individual-based decisions across the 100 million lives it manages. With an understanding for the types of clinical and business problems that can be addressed with API technology, eviCore has begun to explore the advantages of commercially available APIs, like Sansoro Health’s Emissary platform. Plug-and-play EMR integration is a reality today. Within days, hospital organizations are up and running with a standard set of APIs that work the same across EMRs. By leveraging middleware, organizations only code their application once for seamless integration across all data sources. This eliminates the need to build traditional custom interfaces for each EMR, saving significant time, resources and reducing costs – for clinicians, the hospital IT department and third-party solutions. MINNEAPOLIS – (January 31, 2018) – VigiLanz, a digital healthcare intelligence firm, announced today that it has earned 2018 Category Leader designations for Infection Control and Clinical Decision Support-Surveillance in the 2018 Best in KLAS: Software and Services report. These mark the second and third KLAS honors in the past year for VigiLanz, which also achieved the top overall satisfaction rating in the “Antimicrobial Stewardship 2017” performance report for its platform, customer partnerships, and dedication to customer service and support. In the “2018 Best in KLAS: Software and Services,” report, released on January 30, VigiLanz’s Dynamic Infection Control Monitor product garnered a score of 90.3 while its Dynamic PharmacoVigilance product earned an 89.9. The Category Leader designation is reserved for vendor solutions that lead select market segments in which at least two products meet a minimum level of KLAS Konfidence. Rankings are based on customer surveys of North American hospital and clinic executives, administrators, physicians, nurses, clinicians, and other directors and managers interacting with healthcare equipment solutions. Dynamic Infection Control Monitor is a seamless, real-time automated monitoring system that works with an organization’s standard EHR system. Via an automatic exception-based alert system, all patient records are under continuous surveillance to alert decision makers in real time to potential infections, drug-bug mismatches, MDROs, isolation candidates, organism clusters, conditions of concern and reportable infections. The surveillance is based on a sophisticated set of rule engines that can be customized for each hospital. Dynamic PharmacoVigilance acts as a bridge between a hospital’s pharmacy and lab information systems, automating the comparison of patients’ drug usage with lab results, then presenting the potential for Adverse Drug Event reduction. Based on the system’s built-in rule sets or hospital-specific guidelines, the system automatically generates warnings and alerts that help clinicians make appropriate drug therapy decisions. MINNEAPOLIS – (December 6, 2017) – VigiLanz, a digital healthcare intelligence firm, announced today the launch of a state-of-the-art automation solution that helps hospitals optimize safety event reporting and enhance compliance with accreditation requirements. VigiLanz® Dynamic Safety Surveillance transforms clinical data into actionable intelligence, empowering hospitals to achieve greater risk reduction through automated safety event detection, management and analytics. Patient falls and adverse drug events are the most common safety events, which also include surgical errors, wrong blood products, injuries to employees and visitors, and workplace violence. As many as 440,000 people die annually from hospital errors, injuries, accidents and infections. To help combat these issues, The Joint Commission made safety event reporting a requirement for accreditation, which uses the information to improve quality and safety of its hospitals. VigiLanz Dynamic Safety Surveillance overcomes these obstacles by automating the common approaches to managing, reporting and detecting safety events—including capturing information on serious unsafe conditions and resulting adverse events that previously went unreported. For a demonstration of its new Safety Surveillance solution, visit VigiLanz in Booth #212 at the IHI National Forum, taking place Dec. 10-13 in Orlando, Fla.